The film chronicles the struggle between the Nazi and Soviet regimes, from a Ukrainian perspective. 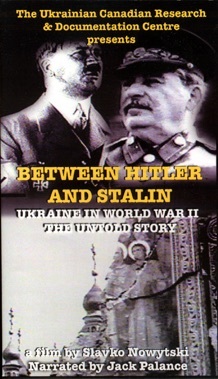 The documentary recounts the events in Ukraine on the brink of the Second World War, during the Soviet occupation of Western Ukraine (1939–1941), the German-Soviet War, the Nazi occupation of Ukraine and the second Soviet occupation of Western Ukraine (1944). NORMAN DAVIES, author and academic, is also a well known lecturer and broadcaster. Professor Emeritus, London University and Supernumerary Fellow, Wolfson College Oxford, he is the author of several historical works on Poland and Russia. His more recent books include Europe: A History (1996), a ground-breaking work which became an international bestseller and The Isles: A History (1999). He is currently working on a study of the Second World War in Europe. He was born in England in 1939 and lives in London. ROBERT CONQUEST is a senior research fellow and scholar-curator of the Russian and Commonwealth of Independent States Collection at the Hoover Institute, Stanford University. He is the author of seventeen books on Soviet history, politics and international affairs, including The Great Terror (1968) and the acclaimed Harvest of Sorrow (1986), a study of the man-made famine in Ukraine 1932/32 which has appeared in many translations. He was born in the USA in 1917 and lives in California. ZBIGNIEW BRZEZINSKI was the National Security Advisor the the President of the US (1977 to 1981), member of the faculty of Columbia University (1960-1989) and is currently Counselor, Center for Strategic and International Studies in Washington, DC. He is the author of numerous books on foreign policy and international relations,and he has maintained continous interest in the post-Soviet world and is the Chairman of the American-Ukrainian Advisory Committee. He was born in Warsaw in 1928 and lives in Washington, DC. This is the full text of the script of the film Between Hitler and Stalin, with annotations (researched explanations of some of the terminology used). SLAVKO NOWYTSKI is a producer/director whose films in 40 years of professional work in motion pictures and video have earned him dozens of international awards. He was born in Ukraine and received his professional education at the Pasadena Playhouse College of Theatre Arts and at Columbia University. He was the Producer/Director of the award winning documentary Harvest of Despair and has created a number of other documentaries. He has worked on the Ukrainian-language weekly magazine-format program popular in Ukraine, Window on America. JACK PALANCE’s film career began in 1952 with the film Sudden Fear. He has appeared in many outstanding films and won an Oscar for City Slickers in 1991. Mr.Palance has played both on the stage and in TV dramas. Jack Palance, born Walter Palahniuk, was of Ukrainian heritage. He died in 2006.